Recently, it has become more and more common to build an Engineering Bay in between the Nexus at the natural and the mineral line. When I think deeper, it is actually pretty interesting. Just to be very clear, the Engineering Bay block I am discussing is not the old school one that you have seen in the previous expansions, whereby you directly prevent the Nexus from being built. 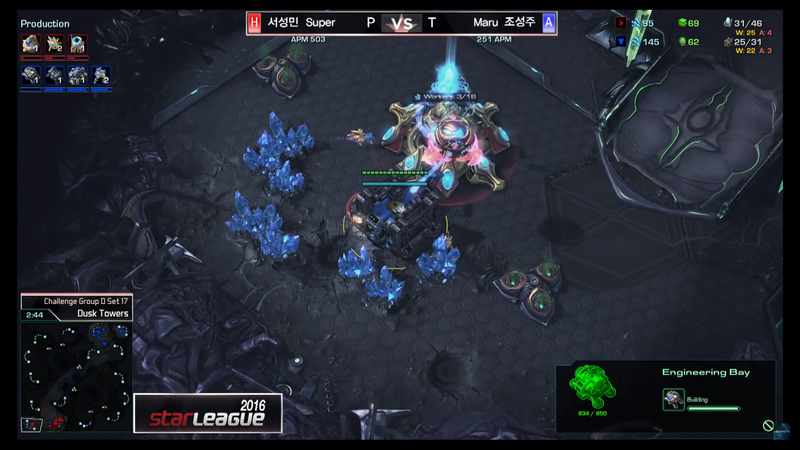 It was meant to punish Protoss for skipping the early Zealot and drastically delay the Nexus. The one I am discussing here is to simply build an Engineering Bay in between the Nexus at the natural and the mineral line (look at the image at the top of this post). The first time I saw it was in TY’s game, and I wasn’t sure if it is objectively a good choice due to the fact that TY is capable to pull off things that others cannot. For example, TY has been using the Sky Terran composition in TvZ, but no other notable professional player has used it to the best of my knowledge. However, interestingly, other players have been following his footsteps and applied the Engineering Bay block in recent games. Look at the vods below to understand how it works. At face value, it is to trade your mineral expenditure on the Engineering Bay with opponent’s mining rate at the natural. The Engineering Bay blocks the shortest mining path of the Probes, and they have to go behind the mineral line to mine from the affected mineral patches. It is important to note that, although an Engineering Bay costs 125 mineral, you actually get back 94 mineral by cancelling it before it gets destroyed (I will explain how to do it later in this post). Thus, it appears that as long as the mining obstruction decreases the mineral gathered by Protoss by more than 31 mineral before the Engineering Bay got cancelled, Terran have come out on top in the exchange. However, Terran do not put down the Engineering Bay at the cost of 31 mineral, but they pay 125 mineral down payment first. In other words, Terran also get disrupted by the temporary cost of 125 mineral, and it affects the build order on Terran’s end before Protoss even get disrupted. Moreover, Protoss’ mining rate is only affected when there are more than five Probes mining at the at natural, because only three of the eight mineral patches are affected (I know it’s more complex than that, but I’m simplifying things here). To make it even harder to evaluate the benefit of this move, it is very hard to measure the decrease in mining rate due to the longer mining path even if you don’t take into account of potentially messing up with the Probes’ AI. Therefore, based on these reasons, I am skeptical of the decision to build an Engineering Bay between the Nexus and mineral line in terms of mineral trade off. I didn’t want to sing praise to the move simply because TY is doing it. Despite the precise mineral trade off benefit of this move is unclear, I am certain that the longer the Engineering Bay stays there the better the trade is for Terran. This is because the trade off is relative to the time the Probes have to take a longer mining path. Let say, a Probe normally takes eight seconds to deliver a mineral crystal for each trip, and the longer mining path delays it for an extra two seconds (clearly the numbers are inaccurate, but I will just use that to make a point). In a time frame of 40 seconds, a Probe would normally have delivered five times, but it would only have delivered four times with the longer mining path. This deficit will increase as the number of Probes and the duration increase. Therefore, Protoss will want to remove the Engineering Bay as quickly as possible, and this leads to the next point. At that point of time, Protoss usually have an Adept and a Mothership Core, and this creates a dilemma. Normally, the Adept would move across the map, and the Mothership Core would stay in base to defend against the Reaper (if it is a Reaper opening). It makes sense to use the Mothership Core to attack the Engineering Bay since it would be in the base anyway, but it is less clear whether it is better to send the Adept across the map or not. As I have explained, the longer the Engineering Bay stays, the worse it is for Protoss. Consequently, the Protoss player has to make a choice between destroying the Engineering Bay quicker with the additional damage from the Adept and sending the Adept across the map with the Engineering Bay stays there longer. In the vods above, the players made different choices, and some even used Probes to attack the Engineering Bay. More importantly, this gives Terran the information where the Protoss units are positioned, and this has huge implication on scouting. Since Terran now know where the Protoss units are (i.e., the Mothership Core is hitting the Engineering Bay), the Reaper can be sent in to scout safely and even potentially pick off a Probe. The timing lines up perfectly for the Reaper to jump right back into Protoss’ base, because that is the time when Protoss have the tech buildings down (look at the images below). The Engineering Bay’s completion bar is empty in the below images because the Scv is no long building it. This indirectly solves one of the biggest issues in this match up, and that is you are extremely unlikely to get a unit into Protoss’ base to scout the tech path at that specific time frame. In fact, some of the recent builds have taken this problem into account and use other ways to scout. I will make a post on this in the future. You can also get scouting information directly from the vision provided by the Engineering Bay. If Protoss want to make several Gateway units early on to catch Terran off guard, you will know if abnormal number of units is hitting the Engineering Bay. Conversely, if Protoss stick to the plan and send the units across, you will be on alert because nothing is hitting the Engineering Bay. If Protoss split up the units, those units sent to Terran’s side would be less threatening. TY actually had a game against Trap (see vod below), in which the Engineering Bay allowed TY to know that the Mothership Core was moving to his side. This indicates a Pylon Overcharge rush, and TY could prepare in advance because of the vision provided by the Engineering Bay. When you send out your scouting Scv at the beginning of the game (usually at 17 or 18 supply), you will see what is in opponent’s base. If Protoss are going for a standard one Gateway expand, the Nexus would have been placed at the natural by the time the Scv reached there. You continue to scout the main, and then move the Scv back to the natural and build an Engineering Bay between the Nexus and the mineral line. The key is to block three mineral patches to create longer mining path, so you need to consider the positioning of the Engineering Bay. While the Scv is building the Engineering Bay, the Probe would normally try to attack the Scv. Just use the halt command (default hotkey is T) to stop the Scv from building, then click on the Engineering Bay again to resume construction. This will move the Scv to the other side of the Engineering Bay to prevent the Probe from attacking it. Repeat this accordingly. You want to have the Engineering Bay as close to completion as possible, but ensure it is not completed (look at image below). To do this, just click the halt command again when the Engineering Bay is about to be completed. Personally, I recommend not to push the limit and halt at the last minute, because the Engineering Bay may complete (I play with high ping, so I know this can happen). You would rather have it at 90%, and not push beyond 95% with the risk of completing it. Then, move your Scv away (if it’s still alive), and assign a control group to the Engineering Bay. This allows you to look at the Engineering Bay easily for scouting reason, and also to cancel it later to get the refund of 94 mineral. Again, you may not want to push the limit, so you can just cancel it at 10 to 20% health. The marginal difference is not worth the risk. Keep in mind that this is mainly used on two player maps, but you can still apply it if you scouted opponent’s base early enough on non-two player maps. I really like the way you research!! Yes, I was just wondering about how good the e bay block is and you made a post about it! It’s a good read. The e bay block is now one of my favourite things to do, and it can get all kinds of desirable reactions from protoss players who have never faced it before. Sometimes they will completely ignore it for 2 minutes, and other times they might even pull probes and adept – msc prematurely to try and bring it down fast. It’s a really easy way to throw a curveball at protoss players, it can make them feel uneasy and nervous. Not everyone thinks it’s a good trade.